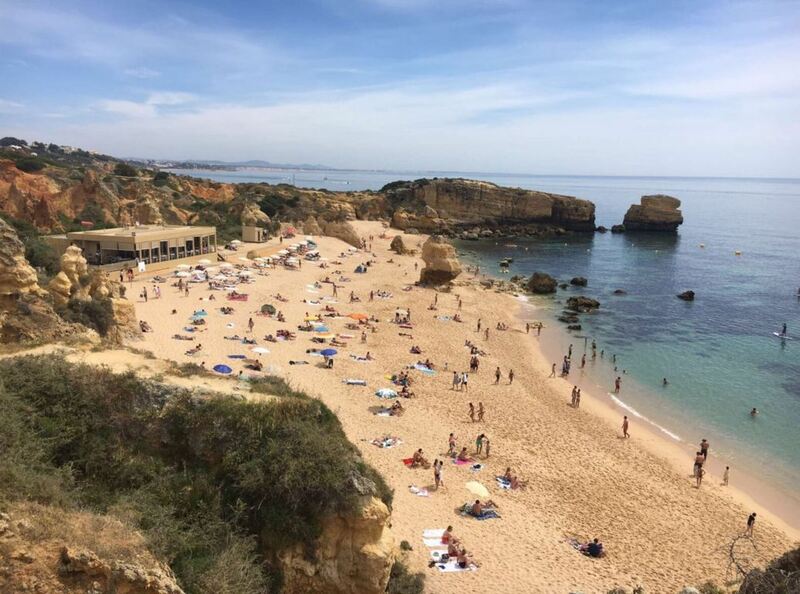 Praia São Rafael is an iconic beach near Albufeira. The beach is known for its beautiful rock formations. 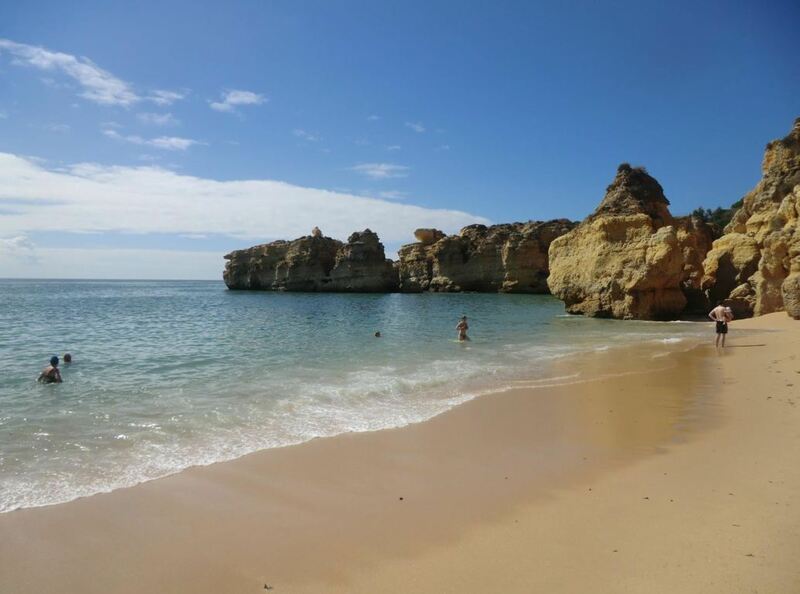 According to TripAdvisor, Praia São Rafael is one of the top things to do in Albufeira. 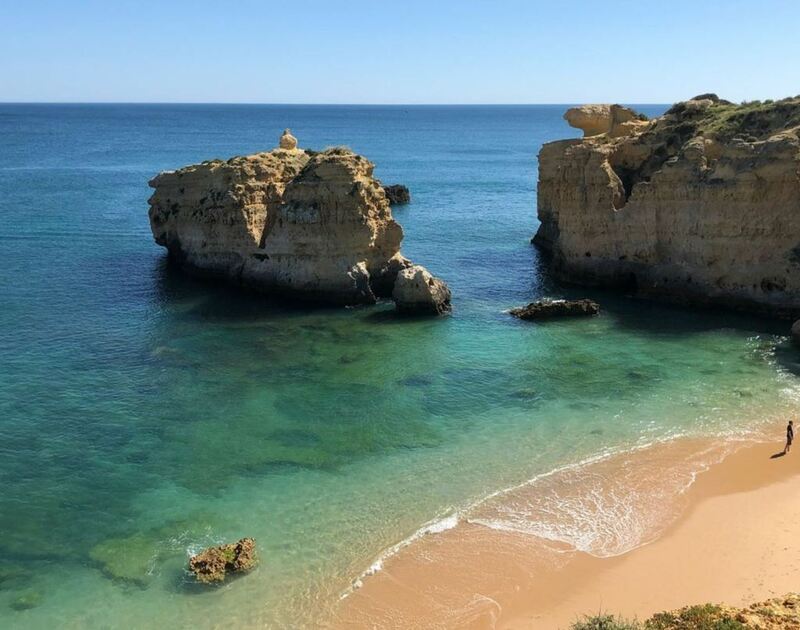 If you are in the Algarve, make sure to pay this beach a visit. 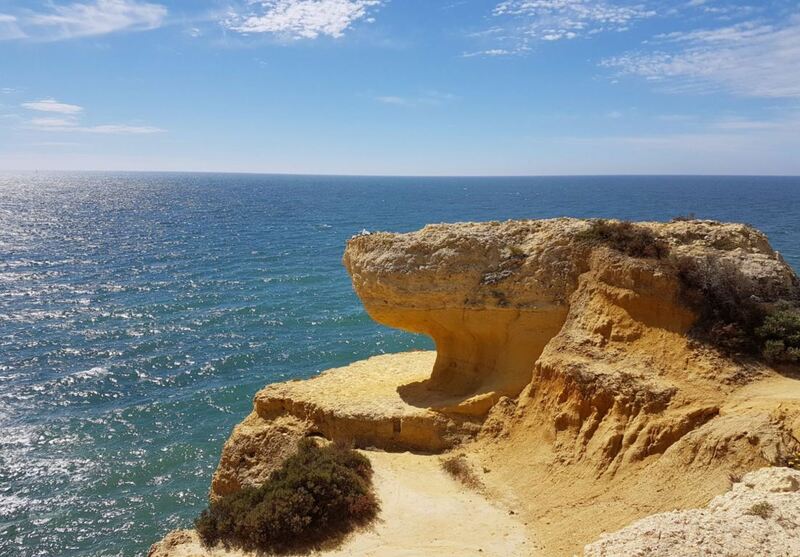 Are you looking for a reason to book your next flight to the Algarve? Then watch the short video below and start packing! Praia São Rafael is surrounded by beautiful red/orange-coloured cliffs. This makes it a spectacular beach, with epic views. The beach is quite sandy, and the sand has a fine gold color. 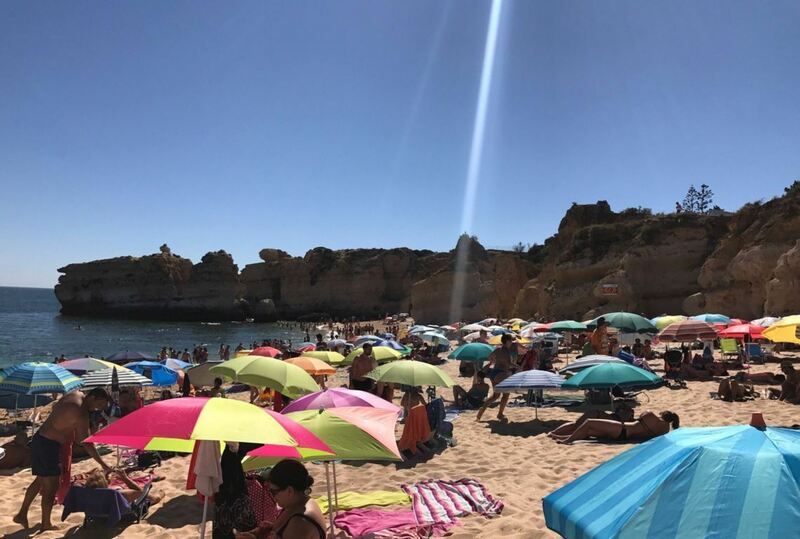 During the summer, the beach is basically divided into two sections: the part with sunbeds (on the left) and the part where you can bring your own parasol (on the right). In summer, the beach can be quite crowded. However, it is usually possible to find spots with fewer people. 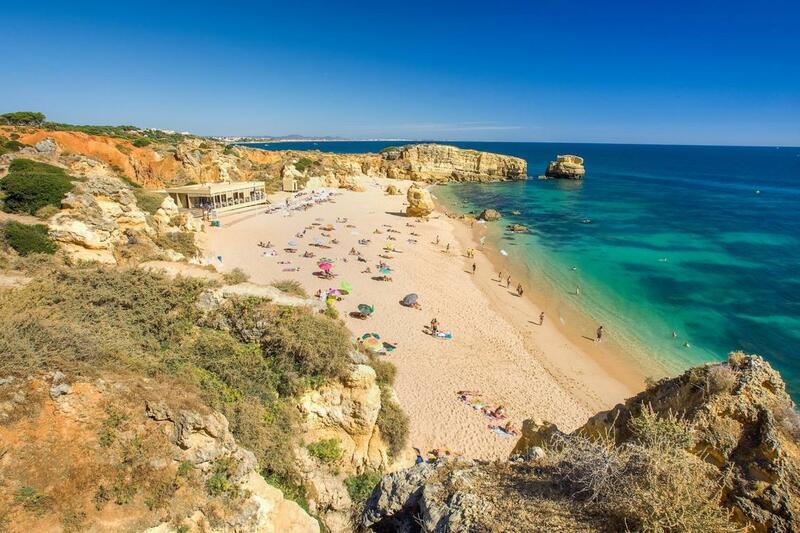 In any case, the beach is less crowded than several other beaches near Albufeira. 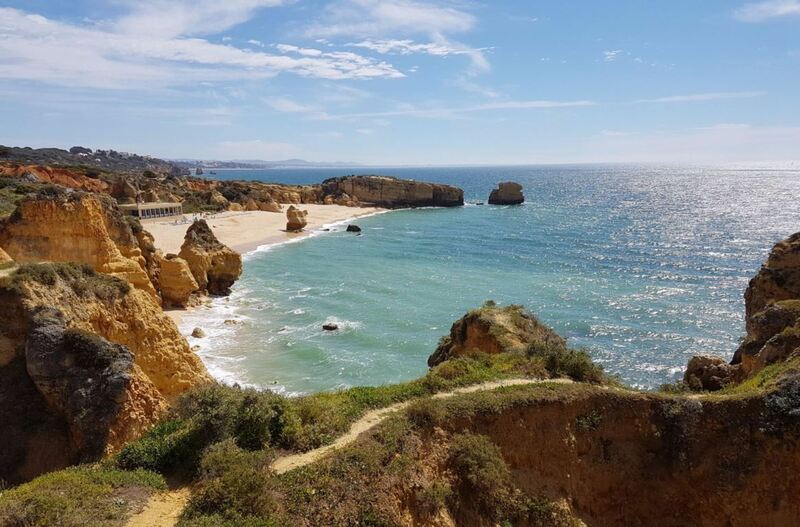 The beach is far enough from Albufeira to attract fewer visitors than the main city beaches, but is at the same time close enough to the city to have all the facilities you could ask for. 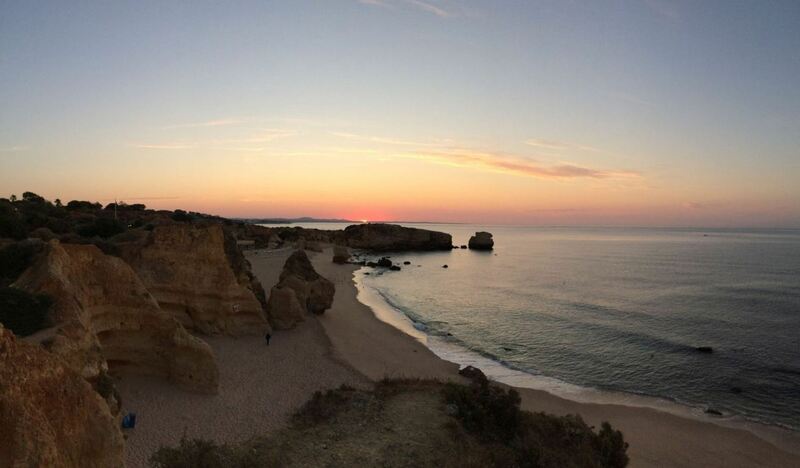 Many people visit Praia São Rafael during the day, and then in the evening they have dinner in Albufeira. On the left side of the beach, you can rent paddleboards and kayaks. They also have instructors, if necessary. Every evening, there is a beautiful sunset on top of the cliffs. If you are around, make sure to watch the sunset from here. 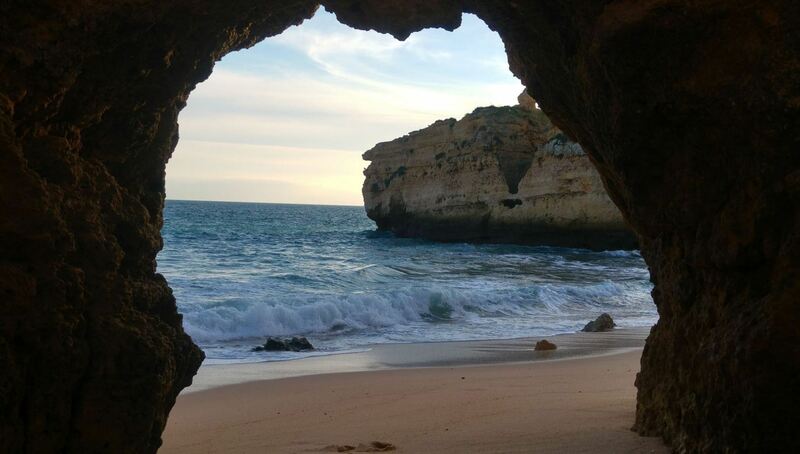 It is possible to view how beautiful this beach is, by experiencing a 360 degree picture of this beach. The sea here is very clear, and the water has a good temperature (especially in summer). This makes Praia São Rafael a great beach for both swimming and snorkeling. You will be able to see a variety of small fishes in the water. So make sure to bring your snorkeling set to this beach! Watch out for the strong current though, especially on the left side of the beach. It can be quite strong on some days, so be careful. Also watch out for the rocks in the water. It can be quite easy to hurt yourself against these rocks. The following drone video shows you the beautiful surroundings of the beach. Ponte Pequena, also known as the Small Bridge. Ninho das Andorinhas, also known as the Swallow’s Nest. You can see both of them from the beach. These rock formations attract quite a few visitors, who are curious to see them. Next to these rock formations, there are several caves and grottoes near the beach. You can walk on top of the cliffs. 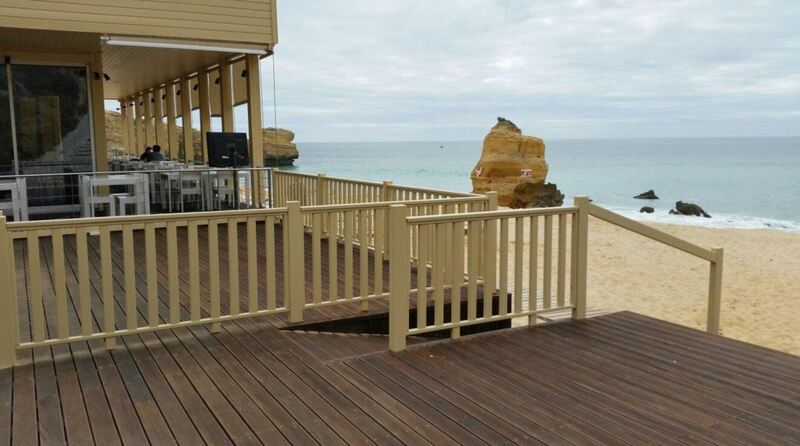 This gives you a great view over the beach and its surroundings. Walking in the area around Praia São Rafael is a magical experience. During low tide, it is possible to walk to walk to the right of the beach, where you will find a small private beach (seen in the picture above). When you walk to the right on this beach, you will also find a small waterfall, at the end, near the rocks. 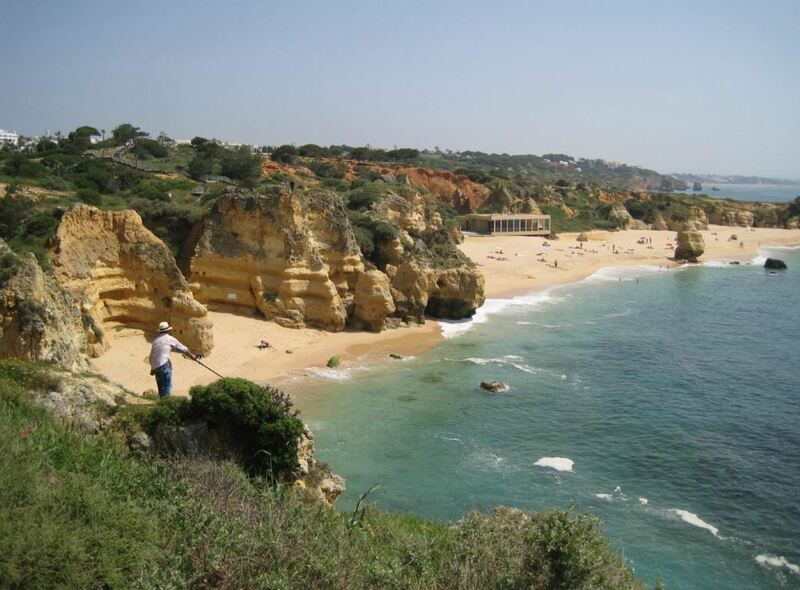 The beach is located about 4 kilometres west of Albufeira. 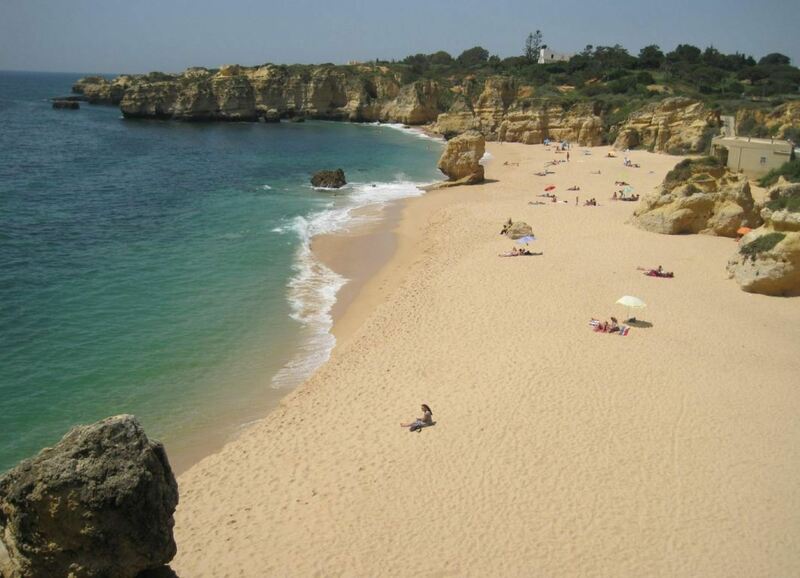 You can reach it by entering the following address in your GPS: Estrada do Aldeamento São Rafael, Albufeira. It is possible to park on a nearby cliff, but only a limited number of vehicles are allowed there. Make sure you get there early in the morning, to ensure a parking spot nearby. Otherwise you can always park on the side of the road. Parking around this area is free. After parking your car, just follow the road and steps all the way down to the beach. There is a restaurant right on the beach, called Restaurante da Praia de São Rafael. The restaurant serves fresh fish and seafood, along with refreshing drinks and snacks. Also you can drink cocktails here in the evening. The restaurant is slightly expensive, but in return it offers a great view over the beach and the sea. It is the only restaurant / bar nearby. São Rafael Atlantico. 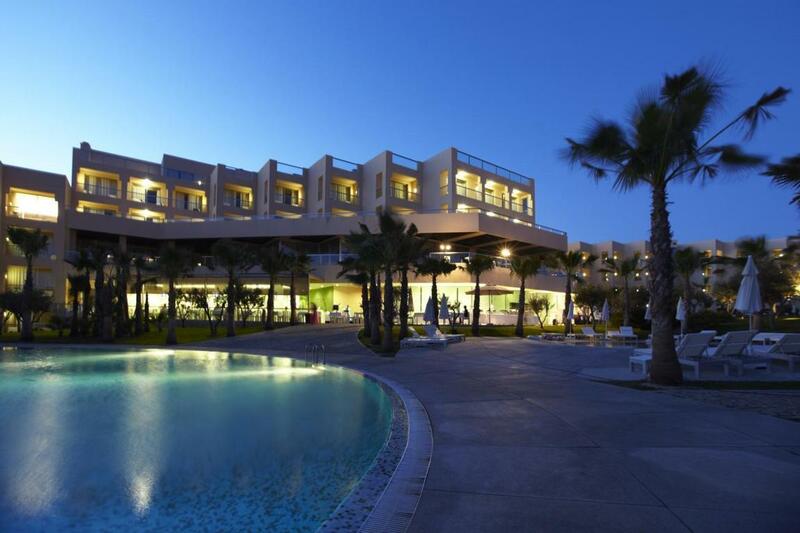 This five star hotel has two indoor swimming pools and offers a great view from the garden. The hotel is only 450 metres from the beach. São Rafael Suites – All Inclusive. The suites of this luxurious five star hotel offer great views, and the hotel has three different restaurants. The hotel is a 10 minute walk from the beach. São Rafael Villas, Apartments & Guest House. This resort has consists of several villas and apartments. 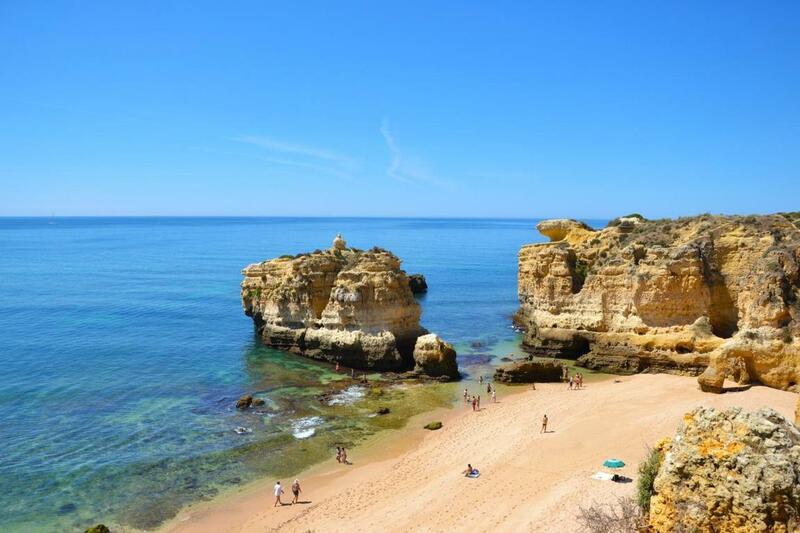 It offers everything you need for a great holiday in the Algarve. After the busy summer season of last year, we recommend to book your hotel now, as it will probably sell out. Below you can find a map with the location of hotels near Praia São Rafael. By changing the date of your holiday, the map will show you the current prices. 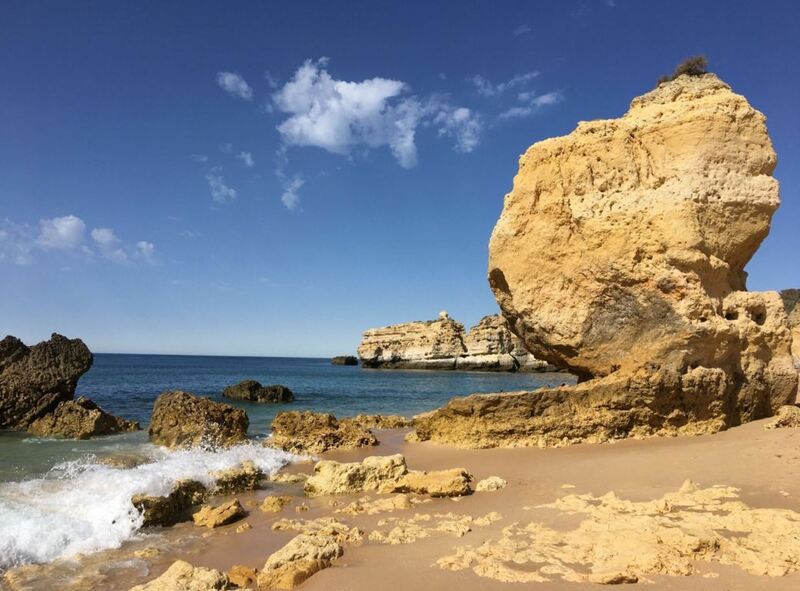 Luckily, there are many things to do around Albufeira. Did you already think about booking an excursion? There are some excursions you can already book online. 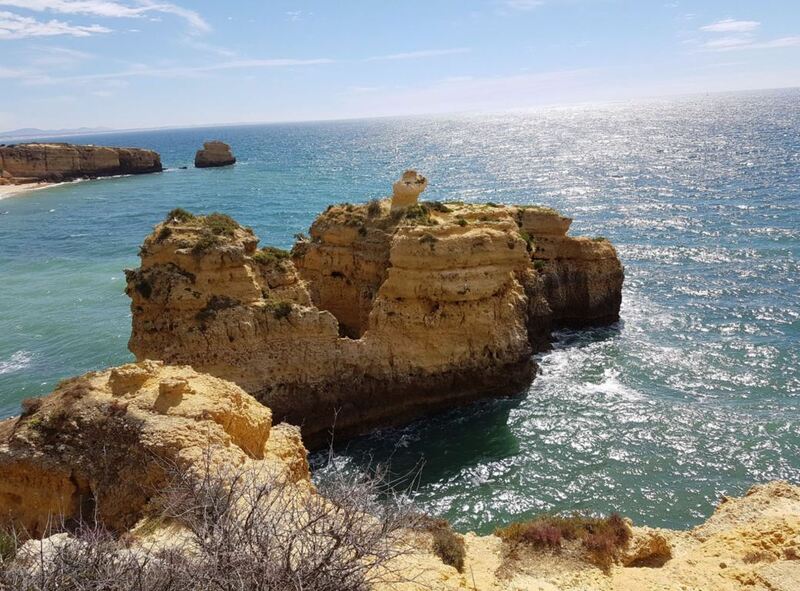 For example, explore the coast of the Algarve by boat and see the cliffs from the other side. Here are some of our favorite excursions. The beach in addition also has good facilities for disabled people. For example, the beach is accessible by wheelchair. It is also possible to get a full body massage on São Rafael beach. There is a massage stand on the beach (open during the high season).